Trump’s solicitor general pick Noel Francisco really loves executive privilege. The president’s solicitor general nominee Noel Francisco thinks executive privilege should shield pretty much everything. Uh-oh. 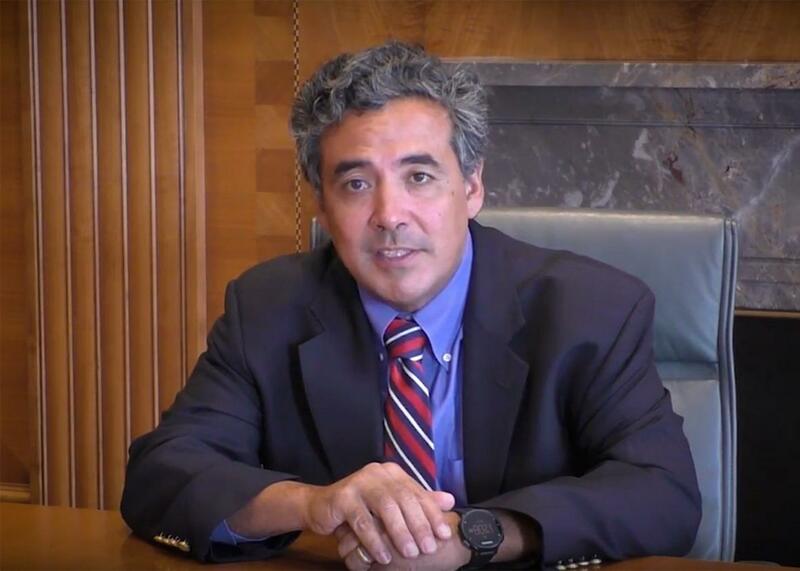 Noel Francisco, now nominated for solicitor general, appears in a Jones Day video. On Tuesday night, Donald Trump announced he had selected Noel J. Francisco to serve as solicitor general. Presuming the Senate confirms Francisco, he will serve as the government’s chief advocate before the Supreme Court and will help to steer the course of federal litigation. Francisco is a capable Republican apparatchik: He worked on George W. Bush’s 2000 Florida recount, then served as associate counsel to the president and deputy assistant attorney general in the Office of Legal Counsel. Since leaving government in 2005, he has mostly represented corporations as a partner at Jones Day, often assisting in their fight against regulations. He is best known for two high-profile Supreme Court appearances. In one, he represented disgraced former Virginia Gov. Bob McDonnell in his appeal of a federal bribery conviction; Francisco argued well and the court vacated McDonnell’s conviction. In the other, he defended religious organizations’ right to deny employees access to birth control; Francisco argued poorly, and the justices sent the consolidated cases back down to their respective courts. Democrats will struggle to mount a case against Francisco’s confirmation beyond his conservative litigation history in private practice—which is not, to my mind, a legitimate source of criticism for an aspiring solicitor general. (It’s a basic American principle not to blame lawyers for their clients’ sins.) Francisco is certainly competent and qualified, if not on the level of his predecessor, Don Verrilli, one of the greatest SGs in modern U.S. history. But there is one fascinating and topical spot on this nominee’s record that deserves greater scrutiny, particularly given the fact that Donald Trump currently occupies the White House. In 2006, the Department of Justice dismissed eight United States attorneys for hazy reasons. Firing these chief federal prosecutors in the middle of a term—and without good cause—was unprecedented and disturbing given the independence they are traditionally afforded. Both Congress and a DOJ special prosecutor launched investigations. It soon became clear that at least several attorneys were terminated because they were deemed insufficiently loyal to Bush, because they were unwilling to pursue highly questionable charges against Democratic politicians, and because they could not find voter fraud cases to prosecute. To uncover the full story, Congress subpoenaed multiple White House and Justice Department officials, requesting information regarding emails, interviews, conversations, and memoranda. The White House complied in part but refused to turn over its own internal communications or to let aides testify under oath. Bush defended these actions on the grounds of executive privilege, insisting the Constitution protected his choice to keep these materials secret. Notably, Bush never claimed he was personally involved in the decision to fire the attorneys. Instead, he suggested that the penumbra of the executive privilege should shield White House aides who discussed matters pertaining to executive functions. The present inquiry into the president’s decision not to reappoint eight United States Attorneys threatens a constitutional confrontation that would undermine our constitutional structure and the liberties it protects. In that system of separated powers subject to limited checks and balances, it is the president’s exclusive prerogative to appoint and remove United States Attorneys. … United States Attorneys are political appointees who may be removed by the president for any reason—good or bad—or for no reason at all. Francisco’s gloss here that the president made the “decision not to reappoint” the eight U.S. attorneys is simply inaccurate. They were fired. But more importantly, the vision of executive privilege he articulates here is idiosyncratic and expansive. To Francisco, any conversation conducted within the White House—including those between aides, with absolutely no involvement by the president—is protected by the privilege. Congress, in his view, is constitutionally barred from subpoenaing communications between White House staffers; it can only demand access to communications between White House advisers and “outside entities.” The ramifications of this theory are discomfiting: If White House advisers engaged in misconduct entirely amongst themselves, Congress could not require them to testify or turn over communications that might reveal their wrongdoing. This conception of executive privilege extends the principle to its furthest possible reach. Congress was not persuaded by Francisco’s line of argument. The controversy culminated in the House passing contempt resolutions against White House chief of staff Joshua Bolten and former White House Counsel Harriet Miers. When the United States House Committee on the Judiciary issued those citations, committee Chairman John Conyers explained why it had rejected the executive privilege claim: “Unlike other disputes involving executive privilege,” he said, “the president has never personally asserted privilege. The committee has never been given a privilege log, and there is no indication the president was ever personally involved in the termination decisions” regarding the fired prosecutors. Ultimately, the Justice Department inspector general confirmed in a scathing report that the terminations were improper and motivated in part by politics. The report castigated government officials for justifying the firings in “inconsistent, misleading, and inaccurate” ways. A special prosecutor, however, declined to bring criminal charges against those involved. Francisco, of course, cannot be blamed for this mess. But his testimony provides a window into his beliefs about executive power—and perhaps a clue as to why he was selected. The Trump administration is already mired in scandal over the president’s multiple connections to Russia. It is not difficult to imagine Congress or a special prosecutor investigating these ties—and getting stonewalled through an assertion of executive privilege. Indeed, the Trump administration has already suggested it will invoke executive privilege to block an investigation into his travel ban. If that occurs, the issue could wind up before the Supreme Court. And if it does, Trump will have a true believer in executive privilege who is ready and willing to defend his right to secrecy.